Wandering around at fairs and festivals in the August heat can be an exhausting and a very dehydrating experience. Usually, by the time I get my hands on an overpriced bottle of water it seems like those numerous water fountains I had walked past just disappear. Instead of having to buy a bottle of water every single time you need one, you could just pick up this little bottle. It completely collapses, so it won’t be so obnoxious to carry around. If you’re out hiking you can fill it up before you leave and once you’ve polished off the water it just slips into your pocket. It’s BPA and PET free, so it’s safe to use time and time again. 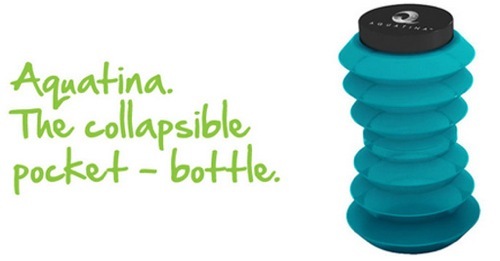 The bottle holds 500ml and can collapse down to 30% of its size. When he was selling just the prototypes they were selling like crazy at about $8 a piece. These are now in the production phase and expected to hit retailers sometime this month.